The Magnificent Seven Show at Hamner Variety Theater is one of the best music shows in Branson MO where you can enjoy watching 75 production numbers in just one show. “Magnificent Seven” is a show in Branson that literally offers everything, dancing, singing, scores of costume changes, and outstanding country music, pops, and tunes from the 40s through today. That’s the reason why it is called a magnificent show. And there’s that unmistakable sound of Motown that everyone loves and the sensational music of the 60s, the decade that fully embraced rock ‘n roll music. And don’t forget the dancin’ disco that invaded the world in the 70s. 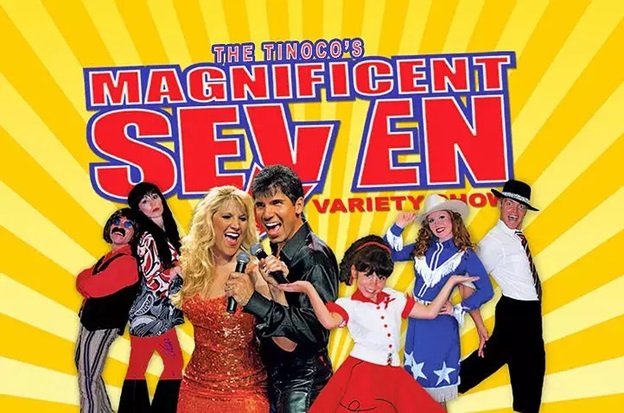 The Magnificent Seven Variety Show is composed of seven talented performers that include Joe and Tamra Tinoco and their 10-year-old daughter Tayla, Dusty Wooldridge, Josh Caroll, Sharie Nievar, and Jeanne Kilbane. These great artists will stun audiences with a musical revue of the past seven decades of pop hits. After the Tinoco family have successfully performed for two years with the world famous Osmond Brothers, together with the Magnificent 7 cast, they bring back their award winning act to Branson at Hamner’s Variety Theater. With the talented performers accompanying Branson stars, Joe and Tamra Rinoco, Magnificent Seven brings high energy performance. These seasoned artists help make the dynamic team of Branson performers, Cameron Hansen, Bethany Hansen, Dusty Wooldrige, and Cassie Sears that bring unforgettable experience in everything from ballet to Broadway to the stage. The wonderful line-up of great performers in this fascinating show include the number seven Tayla Tinoco, who already has years of experience in musical entertainment, including touring with the Osmond Brothers. This two-hour magnificent show provides great fun and wholesome entertainment for the whole family which brings seven decades of country music, swing, rock, disco, motown, broadway, gospel, and more. The Tinoco family combines side splitting comedy, a variety of musical numbers, a tribute to veterans and more in every performance. The show is perfectly completed by a load of fun and laughter and 200 rapid-fire costume changes, making this variety show exciting and entertaining from beginning to end. Displaying multiple musical genres of seven decades and everything else to produce a sensational variety show, you are sure to enjoy this musical show in Branson MO. The name of the show says it all … a truly magnificent show. The show produces a powerful and pleasant jolt to your senses. Superb singing, dynamic dance moves, and tickling comedy come together in one amazing production. The great variety of music is astonishing, producing spectacular musical productions that have captivated Branson audiences for years. The music of Motown, psychedelic 60’s songs to 70’s grooves, you name it, so don’t be surprised if the cast will entertain you with disco fever hits. So, if seven decades of great music with impressive variety of genres is the kind of musical entertainment you want to watch, then the “Magnificent Seven” at Hamner Variety Theater is the music show to watch in Branson.